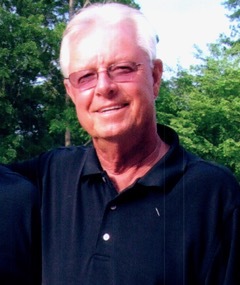 Daniel Jerome Fussell Jr. was born on June 2, 1938, in Rose Hill, NC to the late Daniel Jerome Fussell Sr. and Mary Elizabeth Baker Fussell and died January 20, 2019 at North Myrtle Beach, SC. He is survived by his wife, Jo Ellen Wood Fussell; daughter, Leslie Elizabeth Rodriguez of Levittown, Pennsylvania; son, Daniel Jerome Fussell III “D.J.” and wife Megan of Wallace, NC; brother, David Fussell Sr. and wife Ann of Wallace, NC; grandchildren, Tyler Nevadomski and husband Will, Olivia Buron and husband Steve, Lorelei Fussell and Olivia Fussell; great-grandson, Cam Buron; nephews, Dave Fussell (Angie), Patrick Fussell, Jonathan Fussell (Leah), Steve Pearce (Tabitha); Niece, Amy Hamilton (Bryan); great-nephews, Grayson Fussell, Zachary Fussell, Ayden Fussell, James David Fussell, Tyler Pearce, Noah Pearce, Aidan Gupton; great-nieces, Camryn Fussell, Alyssa Gupton, Camilla Pearce, Brynlee Hamilton; father-in-law, Joe Wood; sisters-in-law, Brenda Pearce (Tarbie) and Teresa Wood; and a host of friends who were like family! Preceding him in death are son, Craig Fussell; sister, Lisa Fussell; nephew, Daniel Lathe. Dan attended High Point University where he played basketball and was a proud member of Pi Kappa Alpha Fraternity. He was a lifelong member of the Rose Hill United Methodist Church. Dan was a co-founder of Duplin Wine Cellars and NutraGrape of Rose Hill. He was a skilled craftsman and worked with his father in Duplin Construction for many years. He enjoyed his time in the used car business and going to car auctions with his buddies Billy Floyd and J.T. Kelly. He served in the National Guard Reserve. Dan was an avid golfer and a wonderful dancer! His most recent passion was metal-detecting and he enjoyed the many new friends he made in his role as Digger Dan. He enjoyed spending time daily at George Hawe’s Filling Station, The Trading Company and occasionally breakfast at McDonald's to “chew the fat” and solve the world’s problems along with many other “experts”! He loved his beach buddies! He loved his Rose Hill High School classmates of 1956! He loved his golfing companions! Most of all he loved his family! He showed us that love in many ways! We will always remember his advice to spend wisely (unless it was a new golf club), his hidden stash of sweets (a habit inherited from his father), his inside jokes that only Davis Lee and Leon Wells understood, and the precious memories made living with his Lorelei and Olivia Claire, who he prayed would remember Grandaddy! He was blessed, he was loved and he was saved! To God be the Glory! A private graveside service will be held in the Fussell Cemetery in Rose Hill on Wednesday January 23, 2019 at 10:00 am. An 11:00 am memorial service will be conducted by Pastor Chris Leak at the Duplin Winery Chapel, located at 918 West Charity Street in Rose Hill. The family will greet guests following the memorial service. Serving as pallbearers are: Dave Fussell, Patrick Fussell, Jonathan Fussell, Grayson Fussell, Ayden Fussell, and Jonathan Murphy. The family requests that in lieu of flowers that memorials be made to the Rose Hill United Methodist Church Building Fund. A service of Padgett Funeral & Cremation Service of Wallace, NC.